Every run should have a goal. Our goal last Monday was get a cold weather personal best (PR) for Chris. Sunday night when we pulled up our trusty weather apps we saw what we were looking for… A cold day with a windchill of -6 planned. It was President’s Day and so Chris had the day off and I decided to take the day off since my kids had off school and the opportunity to run the trails at Pemberton in very cold conditions could not be ignored. So we decided to start a little later for two reasons…. We could and it made better sense to run in the light due to the icy conditions and the rock hard trail conditions. Four layers of clothing everywhere, except my hands and head. My head was covered with a hat and the hood from my running jacket, but my hands were only covered by my cold weather running gloves. Bad idea. The brutally cold tempurature (for a couple of guys from Maryland) ended up stinging my hands. So cold that I had to shake the cold away. I guess it didn’t help that my gloves after years of use had a few small holes in them. I need to revisit the gloves in future cold runs. Everywhere else I was sweating like a mobster in church. Chris went down first as I snapped a first pictures. He then yell that I couldn’t miss the view of the opportunity. All I hear is – “We may never get this chance again” – so we ran it. 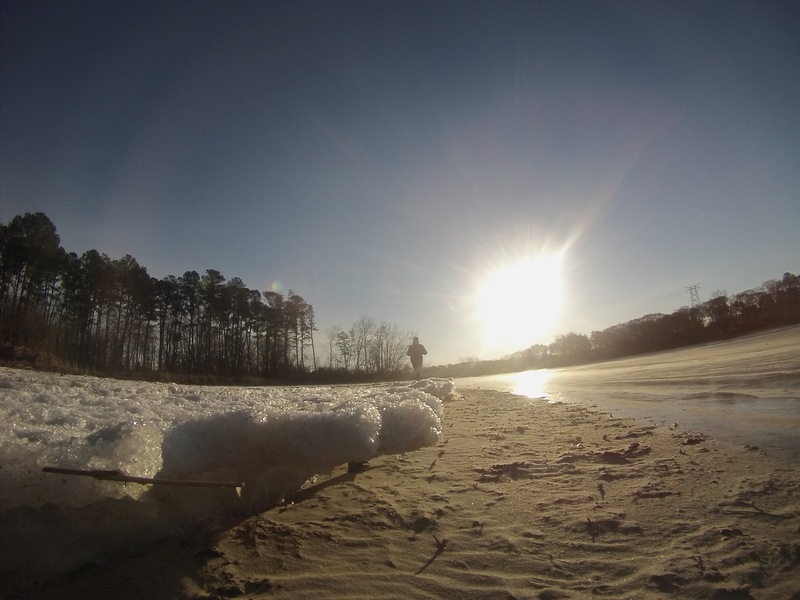 We ran the Wicomico River. Having grown up on Delmarva Chris and I knew how the river normally is. It is normally muddy, slimy, and a mess. It is marshland that was a frozen “tundraland” last week and we captured the opportunity. The river was iced over and the mud was solid and very runnable. We ran a mile and half on the riverbed and were able to get amazing views as the river twisted around a curve and the sun came out over the frozen water. There was one step that was a bit sketchy… I took what might have been a little too forceful of a step and my right foot went completely through the ice, but it was so cold I just ended up with an icy, frozen muddy foot. No harm. No foul. When you have a chance to run something epic. Do it. We completed our cold run after 6.2 miles and Chris logged his coldest run ever. My coldest run was last year in White Plains, New York in a frigid -10 windchill and of course I hope that PR drops soon, but until that happens I hope to keep my hands warm and my eyes set on more epic runs….